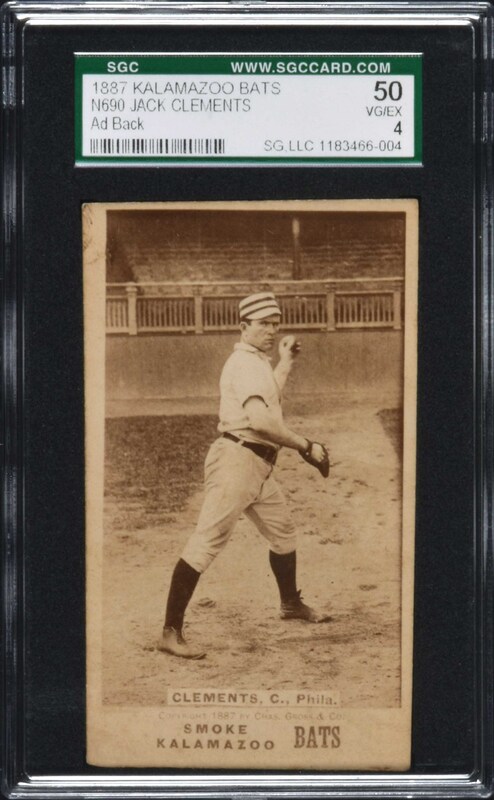 Lot # 17: 1887 N690 Kalamazoo Bats Jack Clements - Rare Advertisement Back! Graded VG/EX 50 by SGC. Tremendously attractive Kalamazoo Bats tobacco card of A's catcher Jack Clements. Kalamazoo Bats are revered for their great rarity, unusual outdoor poses, unusual size, and unique design. This example perfectly showcases the great appeal of this rare nineteenth-century tobacco issue. Clean front with exceptional contrast and strong corners. The photo is particularly strong, and with an abundance of interesting details that Kalamazoos are so well known for (such as the bleachers in the background and Clements' classic nineteenth-century pillbox cap). Near-perfect centering, with a slight natural miscut along the top edge. 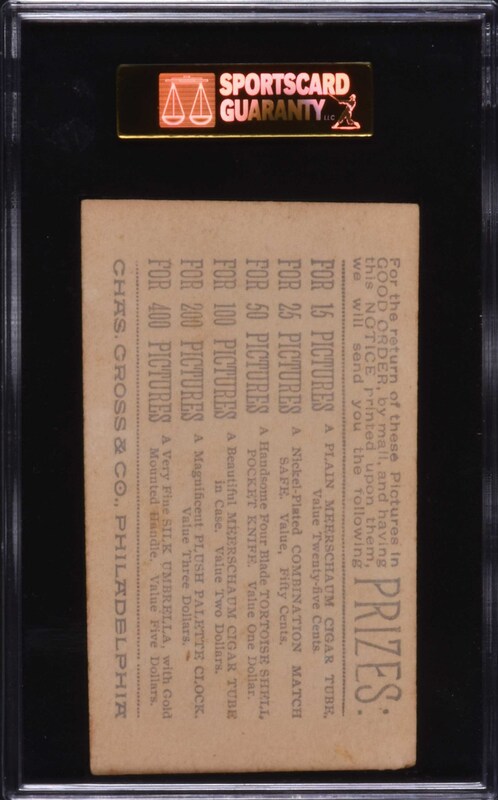 The reverse features a boldly printed advertising back (which is of special note as most Kalamazoo Bats cards have blank backs). This is a stunning nineteenth-century card and an extremely attractive Kalamazoo Bats sample. Reserve $500. Estimate $1,000+.